The record features five original compositions, two by May, including the title track, and three by May and Ellis, and it also includes new arrangements of classic songs including a tribute to the late blues virtuoso Gary Moore and Thin Lizzy's Phil Lynott , 'Parisienne Walkways'. Speaking about the record, the Queen guitarist said: "This album is a true collaboration between Kerry and myself. "Five years ago, 'Anthems' was the result of me producing an exciting new artist - Kerry Ellis. This new record has both our names on it, and breaks new ground. We produced ourselves together as a team. I feel confident it's the best thing we've ever done and a worthy testament to 13 years of belief. It also happens to feature Britain's most beautiful voice!" Also featured are May's remakes of 'Born Free', the May-Ellis 'The Kissing Me Song', a re-cast of Ruth Moody's powerful 'One Voice', and a new version of 'Amazing Grace'. Alongside the classics are brand new self-penned high energy offerings such as, 'It's Gonna Be All Right' (The Panic Attack Song) and 'Roll With You' and 'Love In A Rainbow'. Ellis, 37, says the record is a reflection of her musical journey with the 69-year-old rocker. She said: "This new album has been a real journey of discovery and I feel so proud of how Brian and I have developed over the years; we have learnt how to work together and inspire each other to create special performances and music. "The album is really a mixture of our experiences and has a story behind each song. 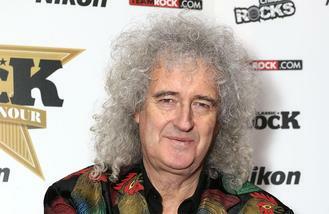 Brian and I have had such fun developing it and can't wait for people to hear it." The announcement of the new record - which follows 2013's 'Acoustic by Candlelight' LP - is a real treat for fans of the duo as it comes after Brian was forced to postpone a series of show with Kerry in December after battling with a "persistent illness". 'Golden Day's is slated for release on April 7 via Sony Music.